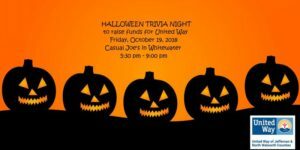 Join us for a Halloween Trivia Night fundraiser! Prizes will be given for 1st, 2nd and 3rd place teams as well as best costume – so come dressed up! Team fees are $120 and can have up to six members. Teams can register here.